As you all know, I make some impulsive buys when it comes to pumpkin. I do like tea, but generally the only tea I purchase is Chai because I know I will make it. Otherwise, if I want tea, I will get it from a coffee shop. If you could get teas in smaller amounts, I would probably buy more and be more daring, but when I have to commit to twenty bags of tea or half a pound of loose tea, I play it safe. 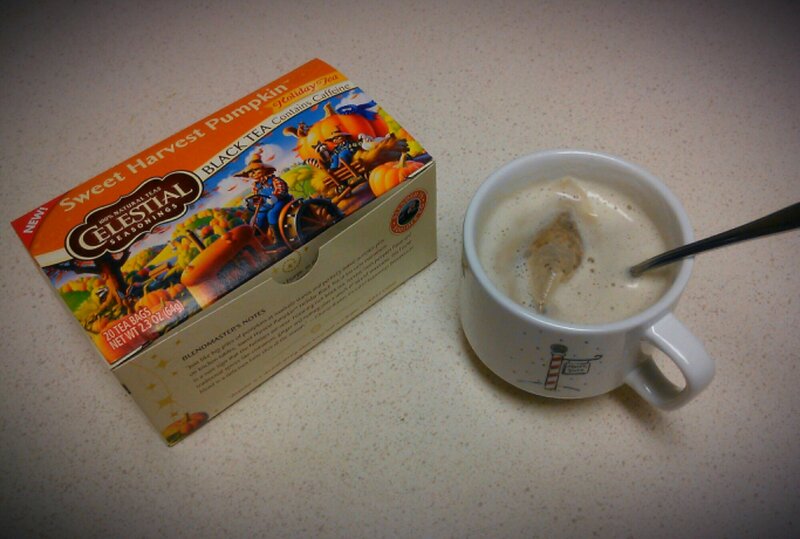 But then I saw this sweet pumpkin tea and threw caution to the wind and bought it. The tea was okay. I do not drink my tea unsweetened, but I do take a sip before I sweeten it so that I know how I want to do so. I could faintly taste the pumpkin, but mostly the ginger, cinnamon, and nutmeg, which was what I was anticipating since it is a tea, but I also tasted something off about it. I looked at the ingredients (which I will do before purchasing from here on out) and saw “natural sweetener,” which was a stevia extract. I know stevia is a natural sweetener and zero calories and all that goodness, but it still tastes like splenda and sweet ‘n’ low and equal and all the other artificial sweeteners to me. And I did not appreciate that the tea forced a sweetener on me; however, it did say it was a “sweet” pumpkin tea, so I should have known some sort of sweetener was in it. I tried to mask it with agave, and that did not work. I also tried to make a tea latte out of it, and I still could not eliminate the stevia flavor. If it was not for that, though, I think I would have liked the tea, so if you like stevia, you can add an extra point to the score.